If you have a creative spark and a passion for shaping the world with your words, you’ll find your niche as a writing major or minor. As a writing student, you’ll work with a faculty mentor to discern your writing strengths and interests as you develop a sophomore writing portfolio and an individualized senior writing practicum. In addition to giving you practical experience in writing, editing and publishing, our writing program offers courses in creative nonfiction, poetry, graphic novels, playwriting, the English language and more. 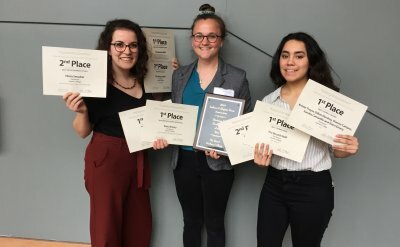 Writing students have interned with top-notch organizations like Sojourners Magazine, Beacon Press and The Lancaster News. The flexibility of the writing program allows you to tailor the program to your own interests and professional goals through electives and extracurricular involvement. 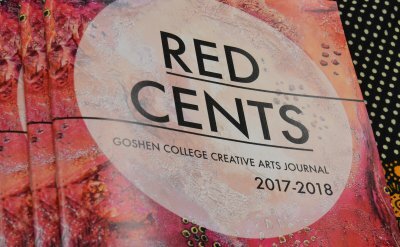 You can publish your writing in The Record, our distinguished student-run newspaper; Broadside, an outlet for short poems and prose; or Red Cents, an award-winning creative arts journal. For your senior project, you’ll write and publish your own book with Pinchpenny Press, then hold a release party to sell it! Goshen College writing students have interned with top-notch organizations like Sojourners Magazine, Beacon Press and The Lancaster News. A writing degree from GC shows future employers that you possess excellent writing and critical thinking abilities, essential for success in graduate school or the professional world. Mary Roth, a 2013 graduate with an English writing major, was chosen as the 2013 Luci Shaw Fellow at Image, a quarterly journal of faith, literature and the arts in Seattle, Washington. Hannah Sommers, a 1996 graduate with an English and natural science degree, is a program manager at National Public Radio (NPR). 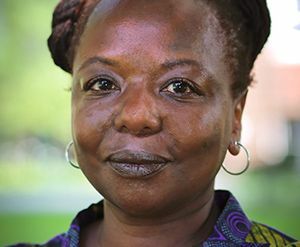 Cora Broaddus, from Lancaster, Pennsylvania, graduated from Goshen College with an English Writing degree. Elizabeth, a 2016 communication and English writing graduate, got behind a video camera her first semester and has been hooked ever since. She hopes to someday travel the world and film the stories she sees and hears. Claude Lilford ’20 is a film production and creative writing double major and theater minor from South Africa.